Hollywood, the place where dreams are realized, has long been an inspiration for interior design in the homes of many. The glitz and glamour of the big screen brings the spirit of Marilyn Monroe and Audrey Hepburn back to life. Incorporate the beauty of that old Hollywood style with just a few minor style guidelines. Spice up those venetian blinds, and learn how to adorn your interior with style. Here are a few tips and tricks for making your home look just as stylish as the old legends of the silver screen. The red carpet has long been a symbol of stature in Hollywood, so why not add it to your new look? That is not to suggest that you adorn your front walkway with red, but to drop a small floor rug down the hallway. A splash of rich red against hardwood and other dark colored flooring will instantly grab the vibes of the rich and famous. A long red runner will bring a chic element to any small area of your home. Capture the faces of the past, and display them proudly around your home. You may enjoy old movie posters as an alternative, but make sure they are displayed in a sleek frame for added aesthetic. Headshots of the great Marilyn Monroe, Elvis Presley, James Dean, or Miss Hepburn herself will remind you daily of the unique history of Hollywood. Show your knowledge of the originals through pop culture art pieces. Every vain girl and guy needs a brightly lit, flashy Hollywood vanity mirror to perfect their look. Choose the specific style of lighting around the mirror to match the style of the room it will call home. Bright globe bulbs traditionally exude the feel of old Hollywood the best. Bulbs that mimic natural lighting are probably the best choice, as it will make applying makeup much easier. There’s no easier way to capture the glitz and glam of Hollywood than to adorn your interior with shimmer and sparkle. 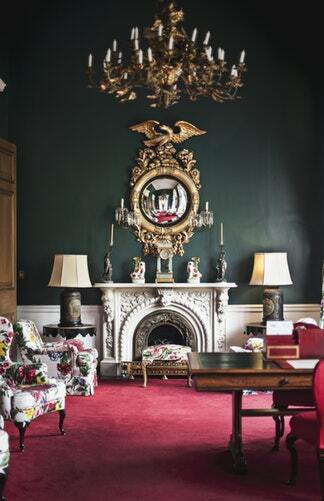 Metallic surfaces, crystal chandeliers, and elegant furnishings scream old Hollywood style. Chic, clean lines are also a staple of the Old Hollywood look. Think upscale and bright, but remember that those aspects do not have to be expensive. There are plenty of gems to be found in the plethora of secondhand stores that exist. When it comes to materials and fabrics, think soft and royal. Bright gem tones and velvet couches are the stuff Old Hollywood is made from. Indulge in the plush and beautiful elegance of antique couches and old chairs.